1950s-1970s: A new generation of Baltimore Jewry continues the geographic move north and west, into upper Park Heights, Pikesville, Reisterstown, and beyond. Many synagogues locate along the upper Park Heights corridor. Block-busting by real estate speculators helps create rapid racial turnover in West Baltimore, including Jewish areas such as lower Park Heights. East Baltimore suffers the effects of disinvestment, job loss, poverty, and misguided urban renewal. 1951: The Jewish Community Center is formed from the merger of the JEA and the YMHA/YWHA (which had originated in northwest Baltimore in 1918). 1951: Joseph Meyerhoff and Golda Meir host Baltimore’s first Israel Bonds meeting. 1956: Helen Dalsheimer becomes the first woman to head a major American Jewish congregation when she is installed as president of Baltimore Hebrew Congregation. 1957: Baltimore’s Jewish population is estimated at 80,000. Through the decade, the community receives a slow but steady trickle of Holocaust survivors arriving from the “displaced person” camps of postwar Europe. 1958: With most of its membership base having moved from East Baltimore, the dwindling Shomrei Mishmeres Congregation contemplates selling the deteriorating Lloyd Street Synagogue to commercial buyers. Wilbur Hunter, director of the Peale Museum, learns of the potential sale and alerts the Baltimore Jewish community to the urgent need to save the building from possible destruction. The Baltimore Board of Rabbis appoints a committee to investigate how the historic landmark might be preserved. 1960: The Jewish Historical Society of Maryland is created, with the mission to acquire, renovate, and maintain the Lloyd Street Synagogue. Four years later the partially-restored Synagogue is dedicated and opened to the public. 1968: Baltimore is hit by riots after the death of Martin Luther King, Jr. Across the city, commercial areas with Jewish-owned stores suffer much damage and many businesses close. The still-bustling East Baltimore Jewish market on Lombard Street recovers, but over the ensuing decade it too undergoes decline. Today, three Lombard Street delicatessens persist as the only remnant of Jewish commercial life in East Baltimore. 1969: Baltimore native Marvin Mandel becomes the first Jewish governor of Maryland, chosen by the legislature after Spiro Agnew resigns to become U.S. Vice-President. The popular Mandel will be elected to two terms in his own right, but his political career is cut short by racketeering charges that send him to prison for almost two years. His conviction is later overturned on a technicality. 1970s: The two latest waves of Jewish migration to Baltimore gather force. Iranian Jews arrive after the Iranian Revolution of 1978. Soviet Jews leave Russia in increasing numbers, a trend that has continued in the post-Communist era. 1975: Baltimore’s Jewish population is estimated at 94,000, tenth largest in the United States. 1981: B’nai Israel Congregation deeds its Lloyd Street building to the Jewish Historical Society of Maryland. The Society restores the synagogue while leasing it back to B’nai Israel, which remains to this day the oldest continuously-operating Orthodox congregation in Baltimore. 1982: Joseph P. Meyerhoff Symphony Hall opens in Baltimore, thanks to a $10 million donation from Meyerhoff. 1982: Barry Levinson’s Diner is released, the first of several popular, critically-acclaimed movies he will make chronicling Baltimore Jewish life. 1983: Shoshana Cardin becomes president of Baltimore’s Associated Jewish Charities, the first woman in the U.S. to head a major Jewish federation. She goes on to become the first woman to preside over the national Council of Jewish Federations and to hold many other leadership posts in American Jewish communal and civic life. 1987: The Jewish Historical Society of Maryland opens a Jewish Heritage Center on the lot between the Lloyd Street Synagogue and the B’nai Israel Synagogue. In 1998 the Society and Heritage Center will become known as the Jewish Museum of Maryland. 1999: The Baltimore metro area’s Jewish population is 91,400, according to the Associated’s Jewish Community Study of Baltimore. The study notes that Baltimore has the largest percentage of Orthodox households of any Jewish community in the U.S. The study also reports that Baltimore’s Jewry remains active and close-knit, with a high degree of Jewish cultural participation and ritual observance. 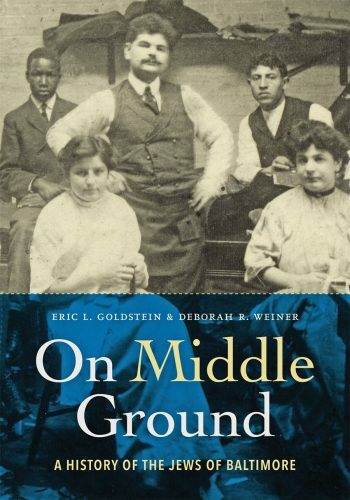 For a more detailed history of Jewish Baltimore, particularly 1950 – present, please check out On Middle Ground by Dr. Eric L. Goldstein and Dr. Deborah R. Weiner. Copies available at Esther’s Place, the JMM gift shop – call 443-873-5179 or email jkonigsberg@jewishmuseummd.org to order your copy!